Pandichelvam Veeraiah was born on June 24th 1986 in Tamil Nadu, India. He completed his Bachelor in 2009 at Anna University, Chennai, India, with a specialization in Biotechnology. 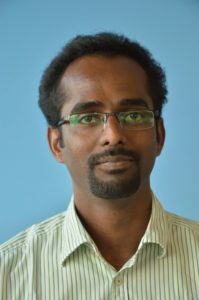 During his bachelor thesis, he gained research experience in the field of Genomics at the Centre for Cellular and Molecular Biology (CCMB), Hyderabad, India. He then continued his research at CCMB, at the NMR Microimaging and Spectroscopy laboratory with a fellowship from the Government of India, where he was involved in research projects to study brain energy metabolism using 1H-13C NMR Spectroscopy in various animal models. In September 2013, he further continued his scientific career as a guest scientist at the Forschungszentrum (FZJ), Juelich, Germany, where he focused on metabolic research in a Helmholtz funding project “Image and Cure for Environmental Metabolic Disease (ICEMED)” on a preclinical MR scanner. Meanwhile (in March 2014) he started his Master of Biomedical Engineering in FH Aachen University of Applied Sciences, Germany. He carried out his master thesis on the topic “optimization and evaluation of multinuclear imaging and 31P spectroscopy at 9.4T preclinical scanner“ at FZJ, Juelich and got his master degree in June 2016. In September 2016, he started as a PhD candidate at the Department of Human Biology/Human Movement Sciences and the Department of Radiology of Maastricht University Medical Center, under supervision of Prof. Schrauwen, Prof. Wildberger, Dr. Lucas Lindeboom and Dr. Vera Schrauwen-Hinderling. His project aims at developing and applying new MR 1H, 13C and 31P spectroscopic techniques to investigate the metabolic abnormalities in the development of hepatic steatosis.